Is divestment only way to bridge fiscal deficit, raise funds? For the first time the government has met its divestment target ever since divestment exercise began in 1991. Even as the government has exceeded the target of raising disinvestment proceeds of Rs 72,500 crore in the current fiscal, the question of enhancing the CPSE’s efficiency largely remains unanswered. 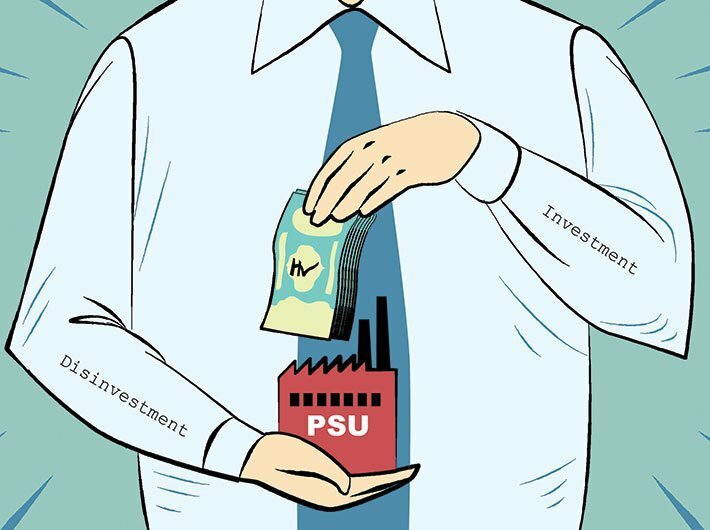 Government’s move of diluting its stakes in some profit making PSUs clearly indicates that it is desperate to meet the disinvestment target and bridge the fiscal deficit. Once a senior bureaucrat had said, “it is not the business of the government to be in business.” However, by divesting its stakes, the government still seems to be in business and is far from fully privatising the bleeding PSUs. After shouldering the burden of beleaguered Air India for a long time, the centre has now decided to privatise the national carrier—a move which should have happened much before. The government has garnered Rs 92,475 crore against the set target of Rs 72,500 crore for the current fiscal, registering an increase of Rs 19,975 crore. Experts say the government has to be firm in privatising a few loss-making PSUs despite the huge opposition of employees and workers’ union by giving them attracting VRS package, more benefits and social security under the new private management. The centre managed to save its face by selling its 51.11 percent stake in HPCL to ONGC just a couple of days before the Budget which enabled it to exceed the target. Had the government failed to seal the ONGC-HPCL deal of raising Rs 36,915 crore, it would have certainly not met the 2017 FY divestment target. Buoyed by the current fiscal’s performance, finance minister Arun Jaitley, while presenting the Budget, pegged the divestment target at Rs 80,000 crore for 2018-19 FY. In order to meet this target, the department of investment and public asset management (DIPAM) has to work tirelessly to figure out how more and more stakes of the government in the CPSEs can be sold out. In 2014-15, the government had raised proceeds of Rs 24,338 crore against the target of Rs 58,425 crore it garnered Rs 32,210 crore against the target of Rs 69,500 crore in 2015-16 and Rs 44,378 crore against the target of Rs 56,500 crore in 2016-17.